Cortical visual impairment (CVI) is a neurological condition that is the leading cause of visual impairment of children in the US and the First World and is commonly seen in people with cerebral palsy (1. Good, Jan, Burden, Skoczenski, & Candy, 2001, p. 56.). It is not an eye condition. Resulting from damaged or malformed visual pathways and/or visual processing centers of the brain, CVI presents very differently than other types of visual impairment. Whereas a typical visual impairment can be diagnosed with an eye exam and vision testing, CVI often presents with a normal eye exam that does not explain the individual’s significant lack of visual function. Because of this discrepancy, CVI has been difficult to diagnose and treat. As I have learned more about CVI, I have begun to grasp how important it is for parents of children with CP or TBI (traumatic brain injury) to be aware of it’s signs and symptoms and how this recognition can make a dramatic difference in a child’s learning and future. At the 2013 AACPDM annual professional’s meeting, Jen, a fellow parent and friend, who also has a child with CP and CVI, encouraged me to attend a presentation by Dr. Christine Roman, a leading expert on CVI. Hidden in this small conference room in a hotel in Wisconsin, I uncovered critical information that I felt I needed to spread to the CP community. The lecture was inspiring and heartbreaking. Tears rolled down our cheeks as Jen and I watched videos of several children, previously diagnosed as blind who were given a corrected diagnosis of CVI, and learned to improve their vision. For years they had been deprived of opportunities to interact with and learn about their world because they were misdiagnosed and no one knew how to work with them. The key was to provide the right setting for each individual child to process visual stimuli. Then it became clear that not only were these children not blind, but that a new world could be opened up to them. I left the lecture and couldn’t stop thinking about whether CVI could explain Maya’s mysterious visual processing problems. When she was three, Maya’s OT kept telling me, “Something isn’t right with her vision but I don’t know what it is.” Her eye exams didn’t offer insight into these problems. Maybe now I had an explanation. 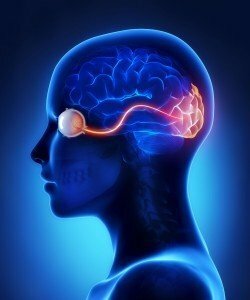 Over 40% of the brain is devoted to visual function! Knowing this information, if a child like Maya has damage to her brain, there is a chance that her visual processing centers may have been damaged as well. During her lecture Dr. Roman discussed how children with CVI are also often misdiagnosed as having other conditions. Some are diagnosed with autism because their behaviors are similar to children on the spectrum (it is also possible for children on the spectrum to have CVI). Children with CVI also may be mistaken for being less intelligent or less capable of learning because of the challenges they have processing visual stimuli. Dr. Roman said, “Some of these children who have brain injuries that are considered ‘so severe’ have been approached by others with low expectations for their learning capabilities. But it’s interesting to see what happens when these children have visual access to their world. Some of these children may not have demonstrated a desire to move because they are not able to see the world in a meaningful way.” After evaluating thousands of children, Dr. Roman reports that a child’s ability to improve functional vision on the CVI range does not appear to be influenced by the type of brain injury. infections of the central nervous system, such as meningitis and encephalitis. Cerebral palsy **One former President of the AACPDM told me he believes more than half of the CP community has CVI and most of them don’t know it! Why haven’t I heard about CVI and how pervasive it is in the CP community? Dr. Roman said that CVI didn’t enter the medical literature until about 20 years ago. Many pediatricians and other doctors are still unaware of the condition and it is likely significantly underdiagnosed. Despite the Academy of Pediatrics articulating guidelines for vision screening and monitoring, there is no protocol for CVI evaluation and monitoring. Without formal recognition and consensus on diagnosis and intervention, time spent on treatment would not be covered by insurance. At this time Dr. Roman says it’s mostly parents and educators who approach her team because they want more answers about their child’s vision that they haven’t been able to get. Dr. Roman hopes that CVI begins to gain more widespread and formal attention from the medical community in order to support assessment and early intervention. The redeeming news for me was that regardless of professional disagreements, Dr. Roman has developed what appears to be a reliable system of evaluation and monitoring for CVI which she readily shares (it’s in her book as well) and which can be incorporated into educational and home settings. What is Dr. Roman’s interest in CVI and what has she done in the field? Dr. Roman began her career working as a teacher of children with visual impairment for 17 years. She was frustrated that many of these children were overlooked and she felt dissatisfied with her ability to help them. She went back to school to learn whatever she could about “this mysterious form of visual dysfunction,” (which she later learned was CVI) and how she could better support these children. She is currently the Co-Director of Pediatric View in Pittsburgh, Pennsylvania and serves as Project Leader of the CVI Project at the American Printing House for the Blind in Louisville, KY. Dr. Roman also is a Project Consultant/Trainer to two 5-year multi-state CVI-mentor training projects working to teach professionals to evaluate for CVI and to employ the CVI educational principles she has developed. Dr. Roman’s contributions to CVI are built upon the foundation developed by pediatric neurologist, Dr. James Jan. She furthered his ideas by establishing the CVI Range, a 10-point scale assessment for determining whether someone has CVI and evaluating their level of function, as well as principles for guiding improvement. Although medicine and special education have not identified a body of best practices for assessment and intervention for children and adults with CVI, Dr. Roman is deeply passionate about continuing to share her knowledge of CVI and what techniques she has discovered to best support identifying, understanding, and improving the vision and education of people with CVI. There are other evaluative techniques used but Dr. Roman has found that these components to offer the most reliable and comprehensive assessment. Difficulty with distance viewing–this is related to the preference for visual simplicity. Objects far away may become lost among other objects or scenery. Difficulty with visual novelty–child looks at familiar thing instead of what is new in the visual field. Because the whole world often looks new to children with CVI they tend to focus on what they can recognize rather than what is novel. The CVI Range assessment is NOT a replacement for an eye exam, but helps to describe how the child sees. It compares visual functions across a diverse population of children 6-21 years old and provides a common language for describing levels of function. The Range is a change model and is supposed to be used to develop appropriate interventions leading to improvement. Dr. Roman’s approach is to develop more vision in the brainso the individual continues to make progress in the range and in turn his/her functional vision.The educator/professional uses the range to monitor changes in visual processing, and adapt the individual’s environment to correspond with those visual processing improvements. Dr. Roman has a goal of getting all children to 7 on the range and, although most people with CVI naturally improve over time, Dr. Roman says progress is dependent on what can be done to foster improvement, as well as to offer support as early as possible. Understand and be sensitive to the child’s visual world. Develop familiar routines and activities. Offer visual stimuli at (but not above) the child’s level. Approach the child gently, with respect and humor. There is no universal CVI program- Each child is unique. Stay tuned for Part 2 on CVI and Cerebral Palsy where I will detail more personal insights and ideas about CVI and visual processing. 1. Good, W. V., Jan, J. E., Burden, S. K., Skoczenski, A., & Candy, R. (2001). Recent advances in cortical visual impairment. Developmental Medicine and Child Neurology, 43: 56-60. Little Bear Sees a website offering wonderful information for parents about children with visual impairment. They also have about CVI available through their website. Dr. Roman was previously the Director and Assistant Professor in the Program in Visual Impairment at Marshall University Graduate College, South Charleston, West Virginia; Research Assistant Professor at the University of Pittsburgh Special Education-Vision Studies Program; and Infant Developmentalist in the Neonatal Intensive Care Unit of Western Pennsylvania Hospital and the Children’s Home of Pittsburgh. She also directed Project CRIB at the Western Pennsylvania School for Blind Children. She has contributed journal articles and book chapters on orientation and mobility, children with multiple disabilities, and visual assessment for infants and has presented lectures and workshops on cortical visual impairment all over the United States and around the world. Previous postQ&A with Dr. Marshalyn Yeargin-Allsopp Medical Epidemiologist & Chief of the Developmental Disabilities Branch National Center on Birth Defects & Developmental Disabilities CDC Next post"I betcha think I don't have CP anymore." The first time I had heard about CVI was during one of Aidan’s therapy sessions with his therapist from SCSDB. She told me she suspected it, and why. After reading up on it, we decided she was right. He watches TV upside-down, because he sees it better that way. He would constantly look away after looking at something, which told us he was trying to process it. It’s VERY difficult to know exactly what he sees, but we do know he sees a good bit, he just takes longer processing it. This is all so true. My son has CVI, “normal eye structures” and all the characteristics described. Dr. Roman gave us a diagnosis and recommendations for working with him that have made a huge difference. He has improved from the time she saw him until now (age 13-19). Teachers believe someone who writes a report and has credentials such as she has. They don’t believe parents. Thanks for sharing my blog post. I think that the more families who know about CVI, the better off all kids will be! I know my son has made tremendous strides since we started focusing on his vision issues. Thank You for this. So, is very broad terms, I was wondering _why_ children with CP are more likely to have CVI. The only thing I know about CP is that part of the brain is involved, as with CVI… Is that the main connection between the two conditions? Or perhaps is there some other specific correlation between the two? Hi Michael. Basically when someone has cerebral palsy they have had an early brain injury. 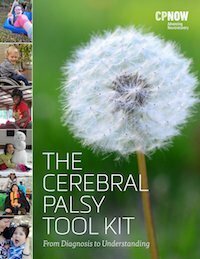 Although a diagnosis of cerebral palsy focuses in on the motor component of that injury, it certainly can affect many areas of the brain that fall outside of motor control/coordination including the area involved with visual processing. Does this help? I’m new to CVI and would be interested in part 2 of CVI. My daughter is 7 months old and we just received a diagnosis of hypotonic CP and CVI. This two part series has been very helpful in explaining the difficulty we had to obtain this diagnosis and find “treatment”. I feel like I found the golden ticket getting to this page! I’m currently working on obtaining my DNP and am presenting on CVI in a couple weeks for a project where we had to propose improved screening guidelines for a disease. For what its worth, a small class of future Nurse Practitioners will be aware of this diagnosis now! Thank you for sharing!!!! Thank you for this. ANd it it is on the rise. My son will be 6 and he was labeled as I wish it was just the processing part for him but he has colobomas and his left eye did not develop. But I am very pleased to announce that at almost 6 he is finally grabbing for things and we think he can see. We have been ding therapy since he was 3 months old. No official diagnosis as that is why we are in the dark and he does not speak so he cannot tell us what he sees. SO do not ever give up. Thanks for this article. My name is Jaysa. I am from the Philippines and I have a son who is going to be 4 years old this month and has CP and CVI. I just learned about CVI in my personal research online and it’s just frustrating that I don’t know of anyone who can assess my son regarding the CVI range. Are there training online for this for parents?